A few people have asked me if I would document the process of the mural I'm working on in the studio, so I plan to post some progress photos from time to time. Click images to enlarge. 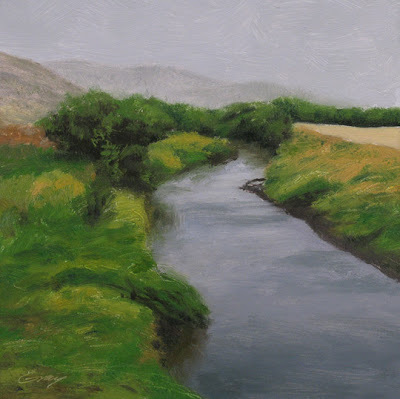 The 8' x 16' mural will be installed on a high wall inside the Pendleton, Oregon Convention Center, and will depict the landscape of that region. I ended up using 1/2" thick medium density fiberboard (MDF,) which laid up beautifully. The surface was primed and then rolled with two coats of highest grade 100% acrylic flat paint. 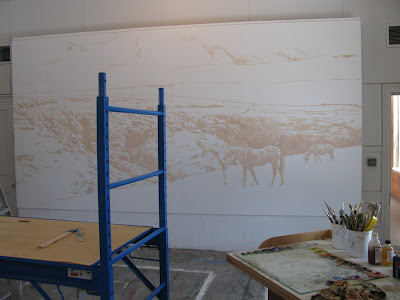 Transparencies of the sketch were projected onto the mural wall, and using light colored paint I laid in the basic lines and rudimentary shadow patterns. the new painting is excellent and thank you for sharing the trials and tribulations of preparing to paint a mural. hope to see more posts on this:)r.
Wow Don, what a performance - I know you are used to it but I think I would feel quite overwhelmed. By the way, I love the rainy day painting. It has a lot of feeling. This is an AMAZING amount of painting to be done!!! Thank you Don for showing this process... I love learning, and following this painting is such a special gift! Not many artists get to do a mural, and especially one this large. I am looking forward to seeing the next stages. Thank you, Sheila. Actually, I'm enjoying this mural a lot. It's fun to paint one in my own studio instead of on location. Also, since this one will go indoors, I'm painting it in oils, which is a nice change of pace from the acrylics used for outdoor murals. Good to hear from you Joanne--thanks for stopping by. I like to work as broadly and spontaneously as possible on murals, so hopefully the painting will move along fairly quickly. Rainy Day is a fabulous piece that feels so there I want to put a worm on a hook (or at least ask my wife to). HA--hi Bill--thanks. Be sure your wife sends you out with your rain gear on too!